Elfsight widget allows displaying your own profile and any pins and boards from Pinterest on your website. Demonstrate your portfolios, inspire your clients to discover new things or just visualize your site content. 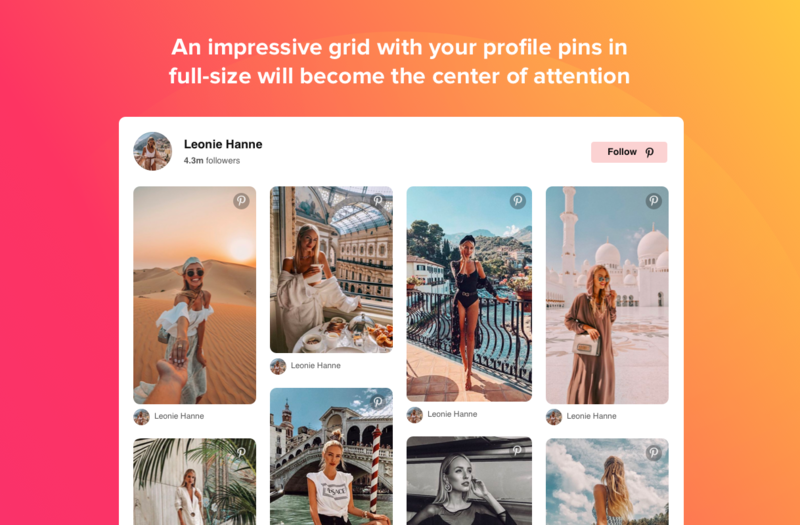 Our customizable Pinterest plugin will help you broaden the reach of your content, increase website visitor engagement, and bring more followers. Integrate your Pinterest account into the website with the help of Elfsight widget. Simply enter your username into the source box. 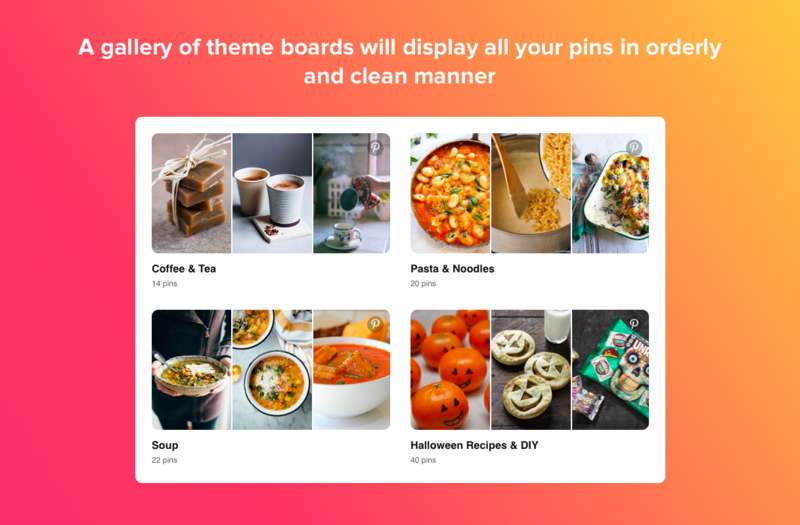 The widget will show all your boards, pins, or both of them. The header shows account name and picture, they are clickable and lead users to your Pinterest account. 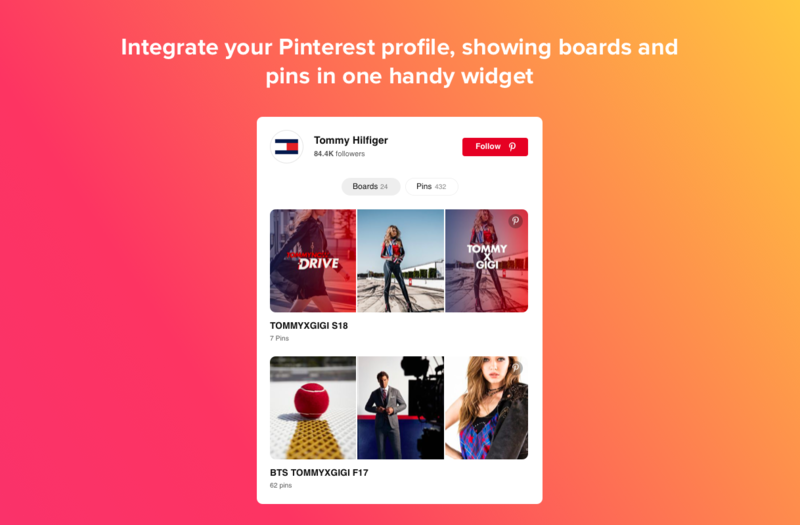 Elfsight Pinterest Feed features a Follow button on the header. It will give your visitors a chance to quickly subscribe for your account and become your followers without leaving your website. A good way to extend your Pinterest community! With Elfsight Pinterest plugin, you can add any boards that you like to your WordPress website by just entering their URLs into the source box. Each board shows a preview, so that visitors will have an idea of the board content. A click on board will open it to show the pins inside. You can select any certain pins that you need and add them to your feed. Copy paste their URLs into the source box and you will create a grid on the website. Each pin has a share icon, that offers several share option on hover. A click on a pin will open it on Pinterest in a new tab. You can choose to show or hide the header of the widget. Switch it on to reveal the name and image of your account, Follow button and count of followers that you have. 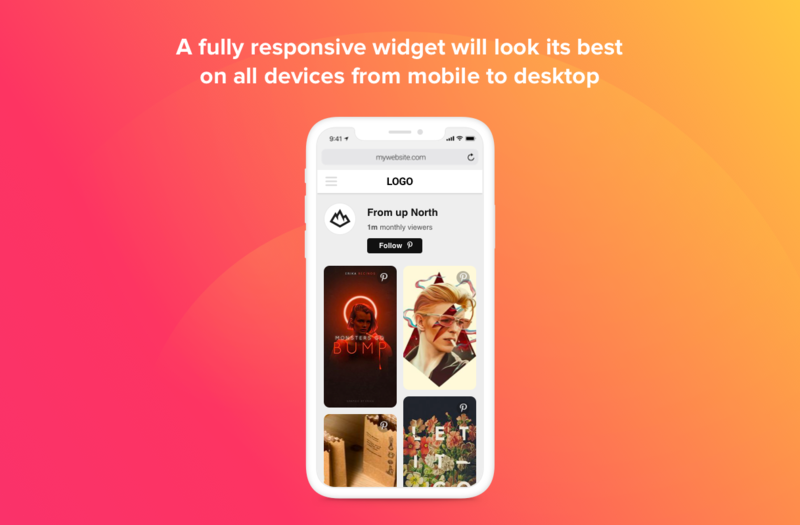 Without the header, the widget will be transformed into a minimalist photo gallery. There’s a widget title as well, that you can edit to your needs. Each pin in the feed consists of elements that can be switched on or off depending on your wish. Author, text under the pin, Share button, and Pinterest icon can be independently displayed or disabled in one click. You can choose the parameters of the widget yourself. 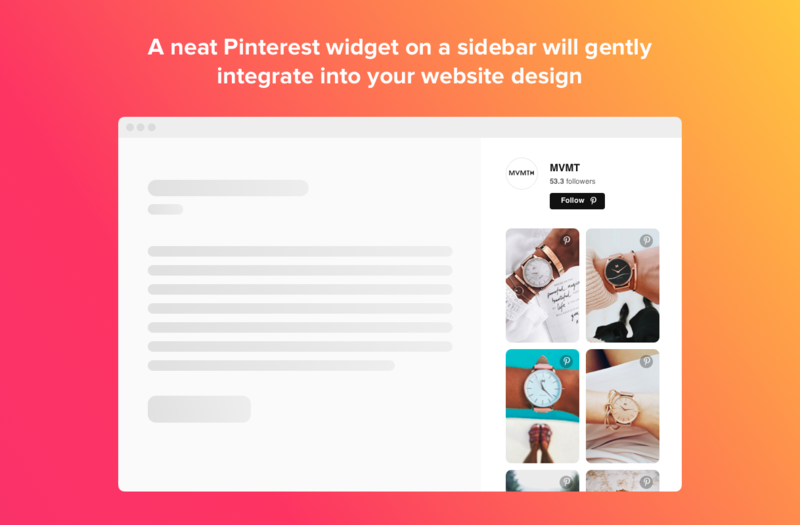 Elfsight Pinterest Feed has flexible size, you can set the width and height in pixels or percentage. Auto option will automatically adjust the widget to the available space. And regardless of the size, your Pinterest plugin for WordPress will stay responsive for all devices. Your Pinterest widget can get the colors you need. You can choose the main theme color, which is applied to the button and links. Smart colorizer will automatically change the button color to the most contrasting. After you created a widget of this plugin, you will receive its shortcode. Use it as any other WordPress shortcode, for example, add it to the page. Our plugin has Visual Composer element of famous page builders to make it convenient for you to work with the plugin if you are using the builder. Easily add Elfsight plugin for Pinterest to a WordPress sidebar or footer of the website for your convenience. After purchase, download plugin archive. Upload setup zip to your website. NOTE! At this stage, make sure you upload not the whole item zip, but just WordPress installable zip. Activate your plugin. Enter plugin settings page through main menu. Simply copy and paste the shortcode of the widget to the required page of your website. That’s it! Now your plugin is up and running! Then just open a ticket in Support Center at https://elfsight.ticksy.com/ and you will receive professional help quickly. Expect our response Monday-Friday from 10am to 7pm CET. Our team is open to our customers and willing to get better! We are a tight and trusted team of full-time developers with 10-year experience. Sharing the same goals and putting our best into what we are doing make us successful. One of our priorities is bringing the of satisfaction with our products to the customers! That’s why you can always rely on us! Our product doesn’t work correctly on your website? Then report your problem or bug describing it in detail and send us a link to your website. We’ll do our best to find a solution. We release new updates and features regularly. Just don’t forget to check for the fresh version in WordPress admin panel. We are open to hear your suggestions. If you need some specific features, which might as well improve our products, then just drop us a line. We will consider embedding them in our future updates. We do not provide installation services for our plugins. However, we’re happy to offer you installation guides. And if any errors come up during setting up, feel free to contact us. If you still want installation to be done by a professional, you can contact specialists from Envato Studio. We don’t provide plugin customization services. If you need to modify the way some features are represented, share your ideas with us, and we will take them into account for future updates. In case you can’t wait, feel free to contact Envato Studio for customization services. We don’t fix bugs or resolve issues in relation to other plugins and themes, created by 3rd-party developers. Also we don’t provide integration services for 3rd-party plugins and themes. You can always contact us at at https://elfsight.com/feedback/ and leave your feedback. 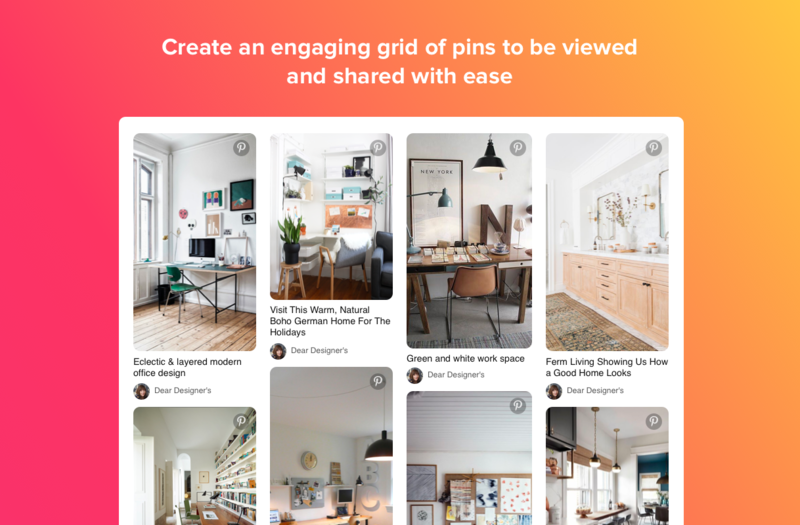 If there’s something you wish to see in the Pinterest plugin, we will be glad to hear your ideas. The most requested changes will be included into new updates to make our clients happy and help them achieve their goals. Still haven’t checked our plugin live? Do it right now on the WordPress Pinterest Plugin page!